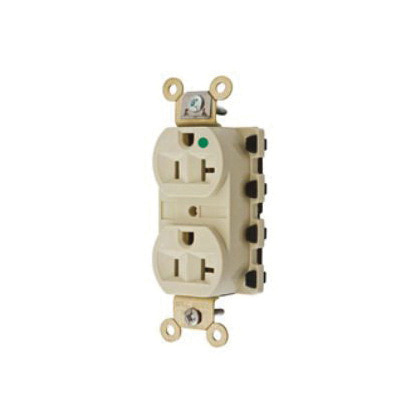 Hubbell-Wiring SnapConnect® Duplex style Specification-grade 2-Pole 3-Wire Extra heavy-duty straight blade receptacle in ivory color, has voltage rating of 125-Volt for 1-Phase and current rating of 20-Amps. It accommodates conductor of size 12-AWG. It features nylon construction for longer durability. It has dimension of 1.56-Inch x 0.86-Inch x 3.28-Inch. Strap mountable receptacle has dielectric strength of 2000-Volt and maximum load capacity of 1 hp. It offers screw terminal connections. Galvanized steel strap offers extra safety while plugging or unplugging. Brass contact ensures better electrical conductivity. The NEMA 5-20R receptacle with grounding, works well at temperature ranging from -40 to 75 deg C. It has V-2 flammability rating. Receptacle is UL listed, CSA certified and meets Federal specification, NEMA® WD-6 standards.